Combine all ingredients. Marinate the ribs for 2 hours. 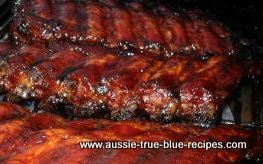 Baste with the marinade while grilling or barbecuing. Serve with hot garlic bread and a tossed green salad.